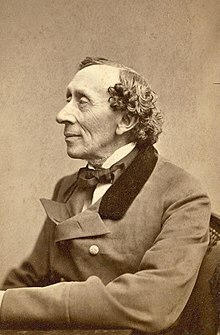 ^ "Criticism of Hans Christian Andersen". 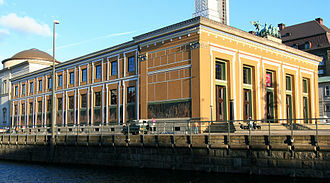 andersen.sdu.dk. Retrieved 2019-02-21. ^ FutureLearn. "Biblical themes in Hans Christian Andersen's fairy tales - Hans Christian Andersen's Fairy Tales - Hans Christian Andersen Centre". FutureLearn. 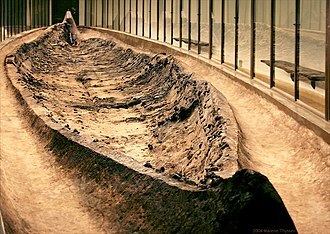 Retrieved 2017-12-07. ^ a b c d "I am a Scandinavian". 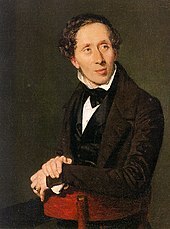 Hans Christian Andersen and Music. Retrieved 2007-01-12. ^ "Who Was Hans Christian Andersen?". Retrieved 2017-09-21. ^ "Fiction Book Review: Nightengale". www.publishersweekly.com. Retrieved 2019-03-04. ^ "Daughter of the Forest". Juliet Marillier | The Official Site | Author of Historical Fantasy. Retrieved 2018-11-20. ^ "Fairy Tale Retellings for Adults: Snow White, Blood Red". Tor.com. 2018-02-08. Retrieved 2018-11-22. ^ "Publication: Black Heart, Ivory Bones". www.isfdb.org. Retrieved 2018-11-22. ^ "Snezhnaya koroleva (The Snow Queen)". imdb.com. Retrieved January 21, 2017. ^ "Ten (The Shadow)". imdb.com. Retrieved January 21, 2017. ^ Webmaster, Rodger Turner,. "The SF Site Featured Review: Silver Birch, Blood Moon". www.sfsite.com. Retrieved 2018-01-18. ^ "The Snow Queen | Joan D. Vinge | Macmillan". US Macmillan. Retrieved 2018-01-18. ^ "H.C. Andersen Park - Funabashi". City of Funabashi Tourism. Retrieved 2017-04-12. ^ Fan, Yanping (2016-11-11). "安徒生童话乐园明年开园设七大主题区" [Andersen fairy tales opening next year to set up seven theme areas]. Sina Corp. Retrieved 2017-04-12. ^ Zhu, Shenshen (2013-07-16). "Fairy-tale park takes shape in city". Shanghai Daily. Retrieved 2017-04-12. 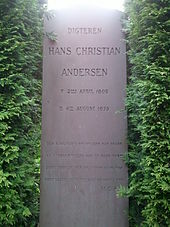 Andersen, Hans Christian (2005) . Jackie Wullschläger, ed. Fairy Tales. Tiina Nunnally. New York: Viking. ISBN 0-670-03377-4. The Snow Queen is an original fairy tale written by Danish author Hans Christian Andersen. The tale was first published 21 December 1844 in New Fairy Tales, the story centres on the struggle between good and evil as experienced by Gerda and her friend, Kai. The story is one of Andersens longest and most highly acclaimed stories and it is regularly included in selected tales and collections of his work and is frequently reprinted in illustrated storybook editions for children. The magic mirror fails to reflect the good and beautiful aspects of people and things, there was only one way to get it out. Years later, a little boy Kai and a little girl Gerda live next door to other in the garrets of buildings with adjoining roofs in a large city. One could get from ones home to the others just by stepping over the gutters of each building, the two families grow vegetables and roses in window boxes placed on the gutters. Gerda and Kai have a garden to play in, and they become devoted to each other as playmates. Kais grandmother tells the children about the Snow Queen, who is ruler over the snow bees — snowflakes that look like bees, as bees have a queen, so do the snow bees, and she is seen where the snowflakes cluster the most. Looking out of his window one winter, Kai sees the Snow Queen. Kai draws back in fear from the window, by the following spring, Gerda has learned a song that she sings to Kai, Roses flower in the vale, there we hear Child Jesus tale. Because roses adorn the window box garden, the sight of roses always reminds Gerda of her love for Kai, on a pleasant summer day, splinters of the troll-mirror get into Kais heart and eyes while he and Gerda are looking at a picture book in their window-box garden. He destroys their window-box garden, he makes fun of his grandmother, the only beautiful and perfect things to him now are the tiny snowflakes that he sees through a magnifying glass. Outside the city she reveals herself to Kai and kisses him twice, once to him from the cold, and a second time to make him forget about Gerda and his family. The Princess and the Pea is a literary fairy tale by Hans Christian Andersen about a young woman whose royal identity is established by a test of her physical sensitivity. The tale was first published with three others by Andersen in a booklet on 8 May 1835 in Copenhagen by C. A. Reitzel. 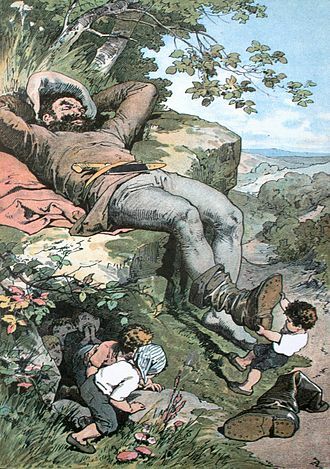 Andersen had heard the story as a child, and it likely has its source in folk material, possibly originating from Sweden, as it is unknown in the Danish oral tradition. Neither The Princess and the Pea nor Andersens other tales of 1835 were well received by Danish critics, in 1959 The Princess and the Pea was adapted to the musical stage in a production called Once Upon a Mattress starring Carol Burnett. The story tells of a prince who wants to marry a princess, something is always wrong with those he meets, and he cannot be certain they are real princesses because they have bad table manners or they are too fat or thin or not beautiful. 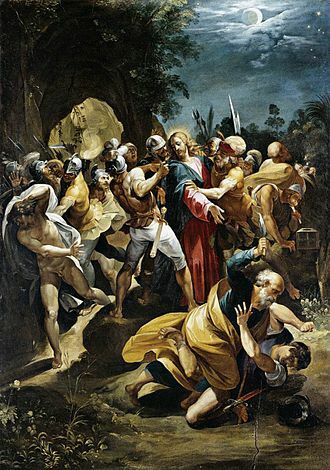 One stormy night a young woman drenched with rain seeks shelter in the princes castle, in the morning, the guest tells her hosts that she endured a sleepless night, kept awake by something hard in the bed that she is certain has bruised her. Only a real princess would have the sensitivity to feel a pea through such a quantity of bedding, the story ends with the pea being placed in a museum, where according to the storyteller it can still be seen today, unless someone has removed it. In his preface to the volume of Tales and Stories Andersen claims to have heard the story in his childhood. T. A. Hoffmann, and other precursors, the earliest reviews criticized Andersen for not following such models. In the second volume of the 1863 edition of his collected works Andersen remarked in the preface, the language had to be similar to the spoken word, the stories are for children, but adults too should be able to listen in. 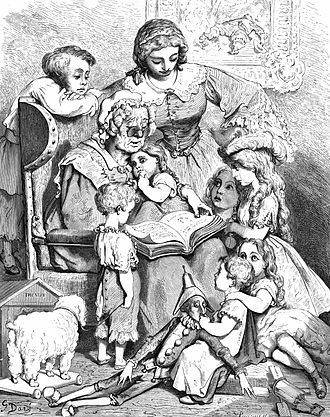 New Years Day 1835, Andersen wrote to a friend, I am now starting on some fairy tales for children. I have told a couple of tales which as a child I was happy about, and which I do not believe are known, on 26 March, he observed that will be published in April, and people will say, the work of my immortality. Of course I shant enjoy the experience in this world, the Princess and the Pea was first published in Copenhagen, Denmark by C. A. One Thousand and One Nights is a collection of Middle Eastern and South Asian stories and folk tales compiled in Arabic during the Islamic Golden Age. It is often known in English as the Arabian Nights, from the first English-language edition, the work was collected over many centuries by various authors and scholars across West and South Asia and North Africa. The tales themselves trace their roots back to ancient and medieval Arabic, Mesopotamian, Jewish, the stories proceed from this original tale, some are framed within other tales, while others begin and end of their own accord. 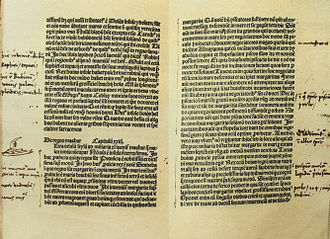 Some editions contain only a few hundred nights, while others include 1,001 or more, the bulk of the text is in prose, although verse is occasionally used for songs and riddles and to express heightened emotion. 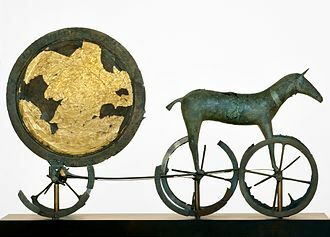 Most of the poems are single couplets or quatrains, although some are longer, the main frame story concerns Shahryār, whom the narrator calls a Sasanian king ruling in India and China. Shahryār begins to marry a succession of only to execute each one the next morning. Eventually the vizier, whose duty it is to provide them, the viziers daughter, offers herself as the next bride and her father reluctantly agrees. 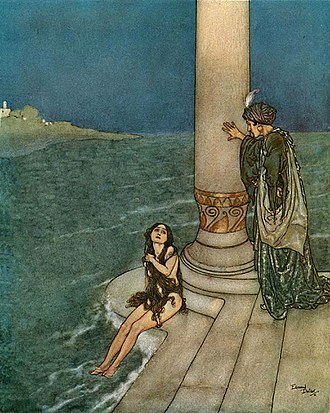 On the night of their marriage, Scheherazade begins to tell the king a tale, the king, curious about how the story ends, is thus forced to postpone her execution in order to hear the conclusion. The next night, as soon as she finishes the tale, she begins a new one, so it goes on for 1,001 nights. The tales vary widely, they include historical tales, love stories, comedies, burlesques, numerous stories depict jinns, apes, sorcerers and legendary places, which are often intermingled with real people and geography, not always rationally. The different versions have different individually detailed endings but they all end with the giving his wife a pardon. The narrators standards for what constitutes a cliffhanger seem broader than in modern literature, the history of the Nights is extremely complex and modern scholars have made many attempts to untangle the story of how the collection as it currently exists came about. Finally, a child cries out, But he isnt wearing anything at all. The tale has been translated into over 100 languages, the Emperor’s New Clothes was first published with The Little Mermaid in Copenhagen, by C. A. Reitzel, on 7 April 1837, as the third and final installment of Andersens Fairy Tales Told for Children. The tale has been adapted to various media, and the title, the phrase The Emperor has no clothes. 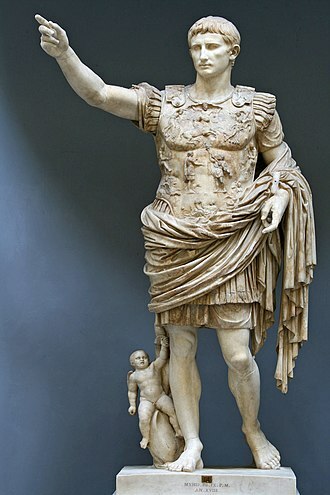 The Emperors ministers cannot see the clothes themselves, but pretend that they can for fear of appearing unfit for their positions, the weavers report that the suit is finished, they mime dressing him, and the Emperor marches in procession before his subjects. The townsfolk play along with the pretense, not wanting to appear unfit for their positions or stupid. Then, a child in the crowd, too young to understand the desirability of keeping up the pretense, blurts out that the Emperor is wearing nothing at all, the Emperor suspects the assertion is true but continues the procession. Andersen did not know the Spanish original but read the tale in a German translation, Andersens manuscript was at the printers when he was suddenly inspired to change the original climax of the tale from the emperors subjects admiring his invisible clothes to that of the childs cry. There are many theories about why he made this change, most scholars agree that from his earliest years in Copenhagen, Andersen presented himself to the Danish bourgeoisie as the naïvely precocious child not usually admitted to the adult salon. The Emperors New Clothes became his expose of the hypocrisy and snobbery he found there when he gained admission. Andersens decision to change the ending may have occurred after he read the tale to a child. 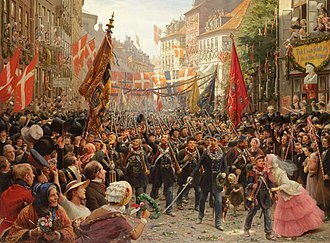 He recalled standing in a crowd with his mother, waiting to see King Frederick VI, when the king made his appearance, Andersen cried out, Oh, hes nothing more than a human being. His mother tried to silence him by crying, Have you gone mad, whatever the reason, Andersen thought the change would prove more satirical. 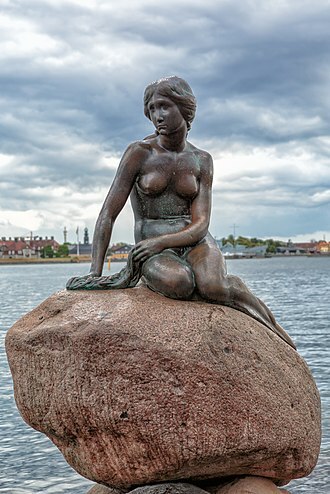 The Emperors New Clothes was first published with The Little Mermaid on 7 April 1837, Reitzel in Copenhagen, as the third and final installment of the first collection of Andersens Fairy Tales Told for Children. The first two booklets of the collection were published in May and December 1835, and met with little critical enthusiasm, Andersen waited a year before publishing the third installment of the collection. Le Locle is a municipality in Le Locle District in the Canton of Neuchâtel in Switzerland. It is situated in the Jura Mountains, a few kilometers from the city of La Chaux-de-Fonds and it is the third smallest city in Switzerland. Le Locle is known as a center of Swiss watchmaking, even cited as the birthplace of the industry, with roots dating back to the 1600s. The municipality has been home to such as Mido, Tissot, Ulysse Nardin, Montblanc, Certina as well as Universal Genève. The name of the town derives from the word for lake or trou d´eau, Le Locle, as well as La Chaux-de-Fonds, owes its survival to the manufacturing and exports of watches. 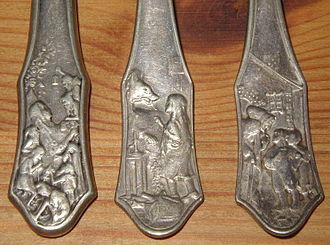 In the 20th century, the industry was added. The watchmaking cities of Le Locle and La Chaux-de-Fonds have jointly received recognition from UNESCO for their exceptional universal value, due to the altitude and the lack of water the land is ill suited to farming. Planning and buildings reflect the watch-making artisans need for rational organization and they were rebuilt in the early 19th Century, after extensive fires. Both towns present outstanding examples of mono-industrial manufacturing towns, which are still well-preserved and their urban planning has accommodated the transition from the artisans’ production of a cottage industry to the more concentrated factory production of the late 19th and 20th centuries. Karl Marx described La Chaux-de-Fonds as a “huge factory-town” in Das Kapital and it is the tenth Swiss site to be awarded World Heritage status, joining others such as the Old City of Bern, the Rhaetian Railway, and the Abbey and Convent of St. Gall. Le Locle is first mentioned in 1332 as dou Locle, the earliest traces of human settlements come from the end of the Mesolithic period in shelter in the Col des Roches. The site includes the oldest pottery found in the Canton of Neuchâtel, along with many tools, the shelter was discovered in 1926 by a customs official and was the first site of its kind studied in Switzerland. However, between 4000 BC and the Middle Ages nothing is known about the Le Locle area, in 1150 the valley, in which Le Locle would be built, was granted by Renaud and William Valanginian to the abbey of Fontaine-André.